The meeting was called to order by Chairman Jon Head. Chief Gilbert gave the invocation. The following member organizations were represented: Allgood, Bangor, Blount County Rescue Squad, Blountsville, Brooksville, Cleveland, Dallas-Selfville, Holly Springs, Locust Fork, Mt. High, Nectar, Oneonta, Pine Mountain, Remlap, Ricetown, Royal, Snead, St. Mountain, Summit, Susan Moore and West Blount. EMA, 9·1·1, Forestry, BREMSS, Blount EMS, Coroner and Life Saver were also represented. 9·1·1 Operations Manager Neal Brooks and Board Member Chief Bob Sanford were also present. 38 people signed the attendance sheets. Melissa Justice who promoted her work with the “Homes for Heroes” program which is available to firefighters, law enforcement, military, healthcare, EMS and teachers. Blount County Sheriff Candidate James Chapman introduced himself and his background along with his goals as Sheriff. Chairman Head asked for the approval of the minutes of the May meeting. Motion by Chief Booth, seconded by Assistant Chief Lay, and carried by voice vote. The Financial Report was approved by a motion from Chief Ayers, seconded by Chief Gilbert, and carried by voice vote. +30 minutes and 53 facility transfers. EMA – Director Don Roybal advised that the Homeland Security Grant program application period opens on June 15 with a deadline of August 22. Don will email a list of equipment eligible for purchase from the grant. Grant requests must have a minimum of $1000.00. May Fuelman totals were at 138% of monthly budgets. 9·1·1 – Operations Manager Neal Brooks announced a 40-hour telecommunicator training class would begin July 9. This class will qualify for con-ed hours costs $25 to reserve a spot. The 911 Center is introducing a 2-way device on the AT&T system for feasibility. TRAINING – Trussville will host an A&O Pumper class soon. FIRE PREVENTION – Chief Booth detailed some last minute FF Academy needs and handed out the IAP and itinerary. Last minute purchases were approved. FORESTRY – Forester Matt Tucker introduced Forest Ranger Kenneth Cain who is from Cleveland. Matt requested all departments that have FEPP equipment sign and return an affidavit related to the equipment possession. BREMSS – Mike Minor reported that new protocols are available and on-line training is available after May 1. There will be EVOC training soon. Local municipal governments will soon receive their BREMSS funding requests. 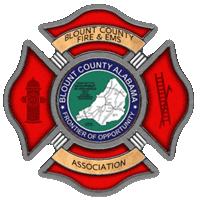 BLOUNT EMS – Operations Manager Weslie Powell thanked all departments for their support and reported things are going well. The dispatchers are trying to track and direct the fastest truck to your incident scene. Wall time in the Birmingham hospitals is the biggest headache in trying to provide area coverage. An EMT Basic class will start Saturday, June 9. CORONER – Coroner Lynn Sweatman thanked all departments for their help and is working with EMA on obtaining mass casualty equipment. LIFESAVER – Don Wilson thanked all departments for what you do everyday. RAMS – Josh Bankston had no report. RED CROSS – Volunteer Coordinator Kim Maynor announced that the new Point of Contact for the Mid-Alabama ARC Region is Damon Summers. He is a retired State Trooper and will be the Disaster Program Manager. Kim asked that you let her know if you need anything. VOAD – Don Roybal reported that the next VOAD meeting will be Thursday, June 14 at 1000 at the EOC.  Those working the Association booth at the June Fling reported good crowds and interaction with the public, especially individuals who had family members serving in the fire service.  There was a reminder about the SE Association Fire Chief Conference in Montgomery July 26-28.  There will be a Fire Safety Summit at the Hoover Met on July 20, no costs to attend.  911 Telecommunicator and volunteer firefighter Kevin Krutchen and his brother Max, also a volunteer firefighter, lost their father in an automobile accident recently. A motion to make a donation of $500.00 from the Good & Welfare Fund to benefit the family of Phillip Krutchen was offered by Assistant Chief Stange and seconded by Co-Captain Baril. Motion passed by voice vote.  An ADPH grant is available to assist with the procurement of NARCAN, an injection medication to reverse the effects of an opium overdose. Every volunteer department is eligible to obtain 2 units through this grant.  Chief Reed discussed the problem of a lack of basic HAZMAT supplies on VFD apparatus. He would like to see an option of how to fund supplies for each department to have supplies available for their coverage area. Minimum quantities of specific supplies and their associated costs should be developed. Chairman Head appointed Chiefs Reed, Netherton, Ivey and Willis along with Neal Brooks to develop a suggested list of basic supplies that need to be maintained within each department and what the associated costs will be. The next meeting will be July 5, 2018 at Pine Mountain Community Center. The meal will be at 6:30 sponsored by RAMS.